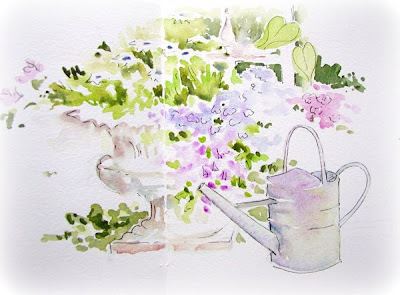 Another Evening Painting in Karen's Beautiful Garden. This is a small journal painting done in my hand bound journal of Aquarius II paper. It was a great evening for talking and painting ~ although the talking does slow down my painting ~ or is it the other way around. Either way, I don't stop painting OR talking. It is always fun to paint with friends. After a couple of hours, it started to rain a little. We don't seem to go for more than a two hour stretch this summer without some rain. We have decided to extend our watercolor class. We will go for four more weeks to get in some more painting time before the summer people start to leave. Some students have requested some drawing instruction, so I am adding an optional hour at the end of each two hour painting class for four weeks. Most of us may not be able to go that long without lunch, so this will probably turn into a picnic/drawing class. Works for me!